Reggae Rockers The Green have been out on the grueling summer festival Warped Tour making a larger fan base for themselves as well as representing the island of Hawaii. The band has literally toured the country and have been setup on the House of Marley Stage with fellow Reggae Rockers Ballyhoo!, Tomorrows Bad Seeds and Echo Movement. The Wapred Tour is nearing its end but for The Green that only means a new one must begin. Obviously when you can go home to the most beautiful place around you have to take a least a few months off to relax right? Nah, not these motivated guys, they have a fan base out there that wants to hear their talents live. 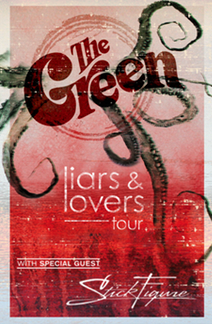 That is why they will be heading out in September on the Liars & Lovers Tour. Stick Figure who has not been out on a nationwide tour in a long time if at all will be opening up for The Green for this Fall Tour. A combination like this can be lethal and should not be missed. So many good vibes are sure to come out of a show from these two that it would be disrespectful to your friends and family if you did not show up. If you are anxiously awaiting tour dates then look no further than below. East Coast dates are set and more will be announced August 14th.